Today's post is the 5th in the series and features responses from Barry W. Hughes of SuperMassiveBlackHole. Already published are responses from Lavalette, Michael Itkoff of Daylight Magazine, Ray Potes of Hamburger Eyes Photo Magazine and Jeffrey Ladd of Errata Editions. Barry W. Hughes: I'm an artist first, so I see things from that point of view and coming up to the end of 2008 I was getting frustrated by the situation in Ireland. It's a small country but contemporary photography was seriously under-represented. I felt we were falling behind and a lot of what I saw here was out-of-touch, so I thought why not do something about it. I just sat down and asked myself what I'd like to see, and could I do something a little different. Seeing how other magazines worked so well it was a little daunting but in the end I knew others felt the same as I did, and I was doing it for the right reasons, so it would be a gamble worth taking. f: What are the particular or unique strengths about what SuperMassiveBlackHole offers its readers? What separates it from other magazines? BWH: I like anthologies so I wanted to make something that introduced more than two or three artists per issue. In terms of content, SMBH offers the reader a much broader approach to the medium too. I try to include as many aspects to the medium as possible, which includes the documentation of other art forms like sculpture, performance and installation. The magazine isn't specific to one location or style so there is also a playfulness evident in the work it presents which I think is important; to be open to different tastes and ideas. 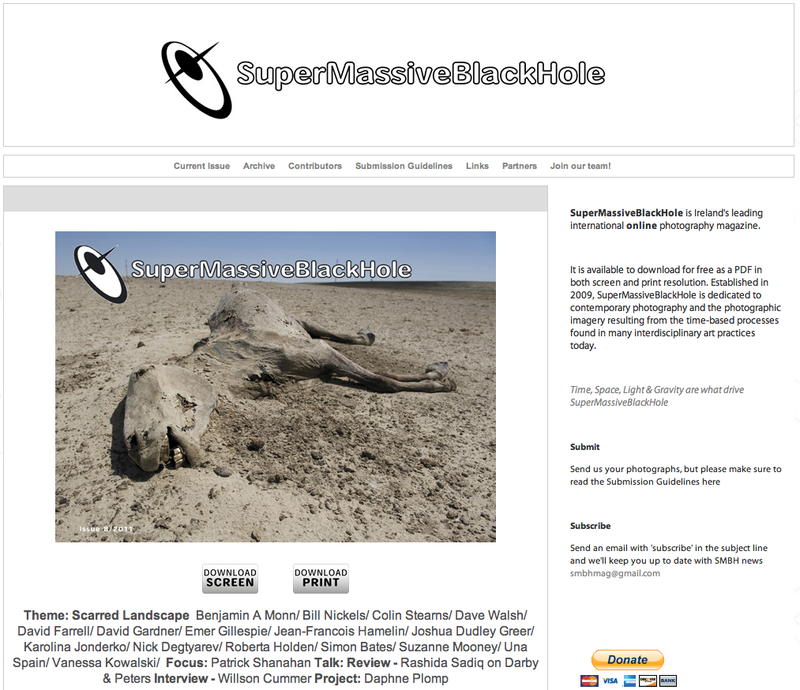 f: How much different has the reality with SuperMassiveBlackHole been from your expectations before launching the magazine? BWH: Obviously when you take on a project like this on your own, with no previous experience and not much of a budget, you have to be realistic about the final outcome. I've learned quite a lot over the last three years, but ultimately it has all been better than expected. BWH: The theme can come from a few places: it can form out of the unselected submissions from previous issues. Sometimes you get a lot of great work but it doesn't make a particular issue, so I keep that work and every couple of months I revisit it to see if there is a pattern or trend there that can suggest a new theme. Another way is just down to my own personal taste. Every now and then you think of a subject and wonder how other artists would approach that subject. I like to include work that shows a unique approach to a theme, that says something different or new. If I can I'll prefer to show work that comes at it all from a less obvious viewpoint. This doesn't necessarily mean the crazier the better, but you want to see artists experiment with ideas and be brave in an intelligent, considered way that will make you want to know more about them and their practice. That is the goal: to share artists work with as wide an audience as possible. BWH: Of course being invited to take part in photo festivals and book fairs, or having people from other countries tell you they have read SMBH is fantastic. And there have been a few moments when I've received an email from someone whose work I have admired for many years saying something complimentary which can make my day. But there is nothing better than having someone like Peter Fraser, who has been the biggest influence on my personal practice, accepting the invitation to contribute. That is the best compliment and the probably the highlight so far. BWH: Admittedly I was very bad at editing my own work before SMBH. It is probably the hardest part of photography. Once I began looking at other's work it didn't seem to be a problem so I eventually figured out a system to edit my own. Being in contact with so many other artists and publishers is genuinely inspiring, and you can't help but be influenced by all the creative and interesting ways there are to make new work and distribute that work. Especially nowadays with digital technology, the possibilities are endless. f: What are your next steps with SuperMassiveBlackHole? Where would you like it to be in two years? BWH: While I'm happy to say I have achieved everything I set out to for the first three years. I have recently been considering some much bigger ideas to do with the website. Hopefully there will be some more exhibitions and I'd like to collaborate with more people on new online and printed projects, and try and turn it into a sustainable business if at all possible. The photographic community in Ireland is quite small, and has only really begun to organize itself, but I'd like to see SMBH grow within this community and use the brand to help expand and develop that community.